Nicky has a PhD in Optimising Practice for Peak Performance in Professional Golf from the University of the West of England, as well as an MSc in Sports Coaching where she specialised in Elite Performance. Nicky is also a PGA Golf professional, ASQ Level 3 Golf Coach, Golf Machine Authorised Instructor (GSEB), TPI Level 3 Certified Golf Fitness Professional, TPI Level 3 Junior Performance Coach, NLP practitioner, and Trackman Level 2 Coach to name just a few of her additioanl qualifications. This enables her as a golf practice and performance specialist to complement the work of her clients’ swing coaches and fitness professionals. 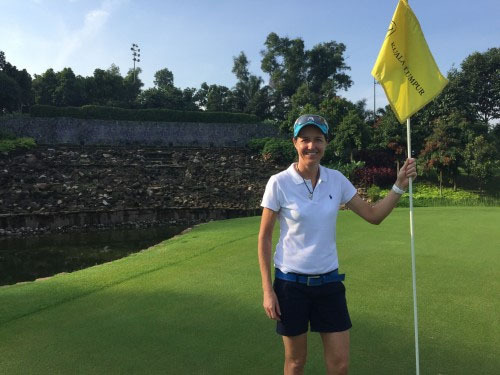 Over the last few years, Nicky has coached and travelled all over the world to gain an extensive knowledge and understanding of elite performance, and she firmly believes that every golfer can always get better! In 2018, Nicky presented some of her research into golf practice and performance at the World Scientific Congress of Golf (Abbortsford, Canada), and at the World Golf Fitness Summit (Orlando, Florida).